Please click the plus sign next to a question to see the answer. Can a 50/60Hz transformer be used at 400Hz? Triad’s 50/60Hz power transformers can be used at 400Hz. The higher frequency will actually lower the core loss of the transformer which becomes more significant in our higher VA transformers. The drawback to using a 50/60Hz transformer at a higher frequency is the weight and size of the transformer. A transformer designed for 400Hz would be smaller and lighter than a 50/60Hz transformer with the same VA. Question: Can Triad provide SPICE models? A Simulation Program with Integrated Circuit Emphasis (SPICE) model requires specific information to model a part accurately. These parameters include but are not limited to resistance, core loss, permeability, and parasitic capacitance. These parameters can be very non-linear with frequency, temperature, and drive level which make them difficult to model accurately over a wide range of operation. A simple, generic SPICE model will be inaccurate and may be misleading. However, if information is needed to build a SPICE model we are more than willing to help to supply that information. Question: What does the "-B" suffix mean on Triad’s Part Numbers? “-B” indicates bulk packaging. Depending on the part number, bulk items utilize trays, tubes, cardboard section boxes or tape and reel packaging, rather than individually boxed. Question: What is Triad’s CAGE Code? Triad’s CAGE Code is 3FRZ0. We are listed as Acumen Electronics Inc. dba Triad Magnetics. For more information about Cage Codes visit https://en.wikipedia.org/wiki/Commercial_and_Government_Entity_code. Question: What is Triad’s ECCN Number? Triad’s Export Control Classification Number (ECCN) is EAR99. For more information about ECCN numbers visit https://en.wikipedia.org/wiki/Export_Administration_Regulations. Question: Does Triad’s WSU Series meet Level VI efficiency? Triad’s WSU Series of External Power Supplies will meetEISA 2007 Level VI Efficiency Requirements. In compliance with the U.S. Department of Energy (DOE) February 10, 2014 published revision toits EISA 2007 external power supply efficiency standard, Triad has upgraded its WSU Series ofexternal power supplies to meet Level VI requirements. All WSU Power Supplies manufactured after February 10, 2016 will meet the minimum efficiencylevels for direct operation as defined by DOE Docket Number EERE-2008-BT-STD-0005-0219. Upgrading Triad’s existing series of WSU external power supplies will provide a smooth transitionfrom the current Level IV requirement. In accordance with the DOE standards all Level IV and Vproducts manufactured prior to February 10, 2016 will remain compliant. Any existing Level IVand V inventory can be delivered to the market without concern. Question: Are Triad Transformers board washable? Standard Transformers which Triad Magnetics offer come primarily in two configurations; open construction and potted. The open construction types are either wound on a bobbin, directly onto a torroid or rod core, or wound on a paper tube with paper sections between each layer of windings. A ferrite core or laminations (usually made of steel) are then introduced and the finished item is dipped in varnish impregnation. Potted transformers follow a similar process path with the additional step of epoxy potting compound being introduced around the transformer. The materials that make up a transformer are all quite resistant to most commonly used solvents in a cleaning operation. The most vulnerable component is the impregnation varnish used. These varnishes are formulated to be thinned with benzene derivative solvents such as xylene or toluene. For the potted transformers, the benzene derivative solvents are also recommended to be avoided, although the attack will be much slower and therefore probably render no damage for short exposures (room temperature for less than 2 minutes). If an aqueous clean is used (often consisting of a 10% to 70% solution of Isopropyl Alcohol and water), it is recommended that an oven bake at least 60°C be included for at least 30 minutes after immersion. The reason for this is that the open construction type transformers have the potential for harboring the water within the windings which will cause oxidation over time. Question: What is Triad recommended Hand-Soldering Procedure? In an effort to minimize the amount of lead that ends up in our land-fills and our water tables, almost all environmentally conscious companies have moved away from solder containing lead to the more eco-friendly lead-free type solders. Triad Magnetics is one of those companies, in that since 2005, all of the products we produce are RoHS compliant. This includes the absence of lead in the solder on our pins, lugs, and tinned leads. The soldering methods for lead-free solder differ from the traditional Sn60/Pb 40 and Sn 63/Pb 37 used in the past. The most significant difference is the need to use a higher temperature on your soldering iron. This paper is published to highlight some of the basic principles for soldering pins with lead-free solder to printed circuit boards. As is the case for all soldering, the proper tip for the size of the pin and pad is important for a good conformal joint. The tip width should be at least 2/3 the width of the pad, but no larger than the full width of the pad. Typically, the solder wire used will have a flux core. Best results will be experienced when the diameter of the solder wire is appropriate for the pad as well. Solder wire approximately equal to the diameter of the pin is commonly specified. A tip temperature of 600°F held to the solder joint for 3 to 4 seconds normally produces a good conformal joint on both sides of the board. A tip temperature of 600°F for just 1 or 2 seconds produced an acceptable solder joint on the bottom of the board, but did not allow enough time for the solder to flow to the other side of the board. A tip temperature of 500°F even at 5 to 6 seconds does not properly bring lead-free solder to the liquidous state. The result is that no whetting of the pin occurs and no solder flows to the other side of the board. A tip temperature of 650°F for 3 seconds causes the solder to flow too freely, often leaving an excess build up of solder on the top side of the board. Higher temperatures also creates a longer cooling time, so the risk of a disturbed solder joint is increased. Triad factories use a soldering iron tip temperature of 600°F and a touch time of 3 to 4 seconds, touching both the pad and the pin. We have found this to be an optimum point for most applications where we are soldering thru-hole transformers to boards. Your factory floor conditions may vary in terms of equipment used, environment, and type of Lead-free solder used. Your process may need to be adjusted in terms of touch time and temperature in order for you to achieve the desired results for your solder joints. Question: What is Triad’s Product Waranty? All Triad Magnetics transformer, inductor and power supply products are warranted to be free from defects in materials or workmanship, and are warranted to meet the Company’s published specifications, but no other warranty, expressed or implied, is made by the seller unless expressly set forth. 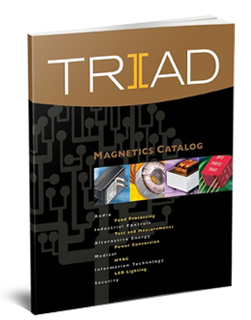 Triad Magnetics warrants its standard catalog power supplies for a period of five (5) years from the date of purchase from an authorized Triad Magnetics distributor or from Triad Magnetics directly. This applies to all of our Switchmode Power supply offerings as well as all of our standard Wall Plug-in Adaptors. Triad Magnetics warrants its standard catalog transformers, inductors, chokes and coils for a period of ten (10) years from the date of purchase from an authorized Triad Magnetics distributor or from Triad Magnetics directly. For special, indirect or consequential personal or property damage arising from the failure of its component / equipment. If the equipment was not used or operated under normal industry applications unless the application was specifically approved by Triad Magnetics. If the component was altered or modified in any way by a company other than a Triad Magnetics authorized alteration. Except to the extent of the dollar value of the component being returned for warranty consideration only. All warranty claims must be processed through the point of purchase and the product returned to Triad Magnetics for verification.